I know most quilters mark designs onto quilts, and I mark my own quilts all the time. But, I am always afraid to mark on customers’ quilts. So, I have been trying to find alternate methods of getting a design onto a quilt. Remember the Press ‘n Seal method? You have probably already tried the following strategies. I have, too, but it’s been awhile since I’ve tried them, so they are new to me yet again. 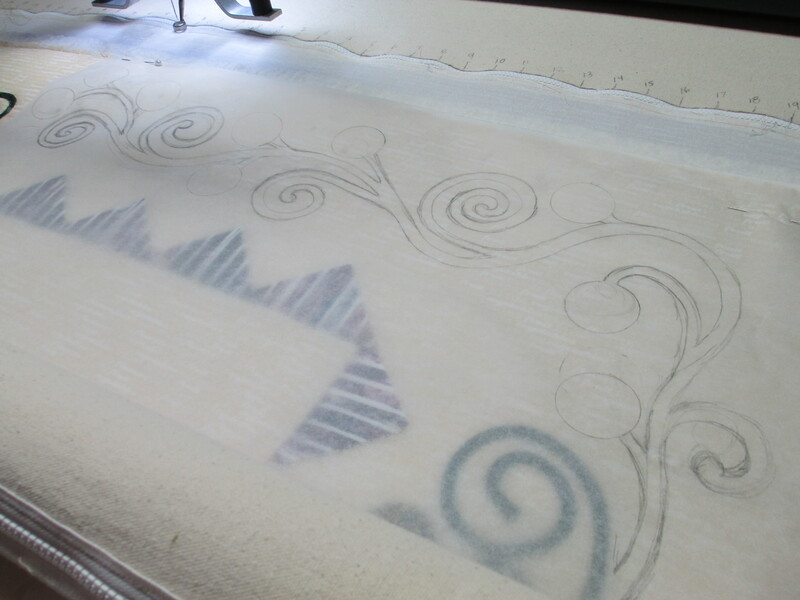 One strategy I tried on Mickey’s quilt last week was to bring my laser light to the front of my machine instead of using it in the back for pantographs. You can see how I drew her dog onto the quilt. On the left is the picture of her dog in black and white. I took a green highlighter and marked on the paper what I wanted to draw onto the quilt. Can you see the little red dot under the dog’s paw? That’s the laser light that is attached to the front of the machine. 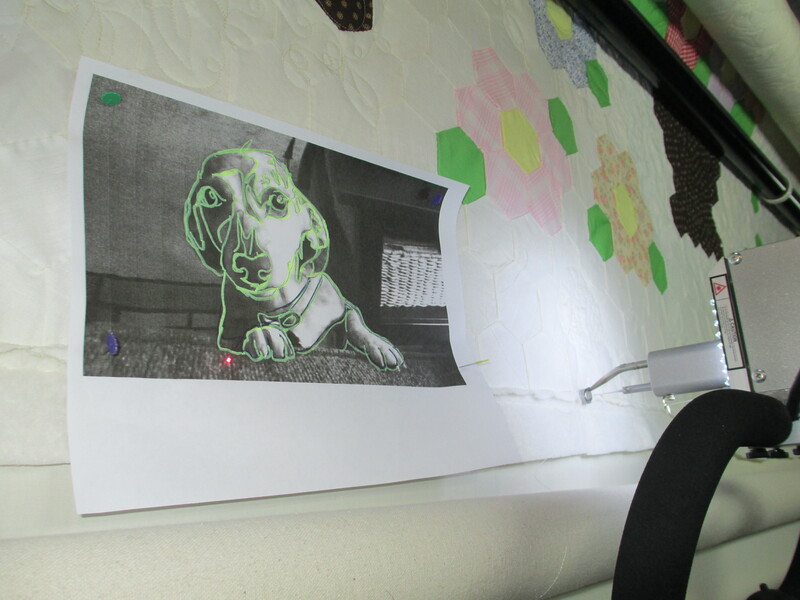 When I move the laser light along where I highlighted, I will be drawing with thread onto the quilt. You can see the finished product on the right. It’s not perfect, but it is one way for me to avoid marking on a quilt. 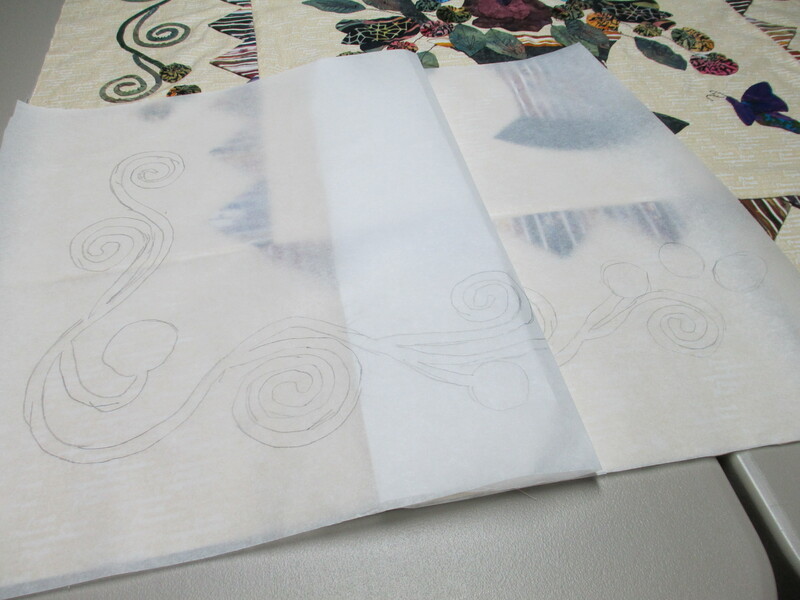 With the quilt I am working on right now, I am trying onion skin paper. I’ve tried tracing paper and vellum. Today I used the onion skin paper. I bought a roll of this from Du-All Art & Drafting Supplies. It’s 50 yards long, so hopefully it will last awhile. The cost, with shipping, was about $32. 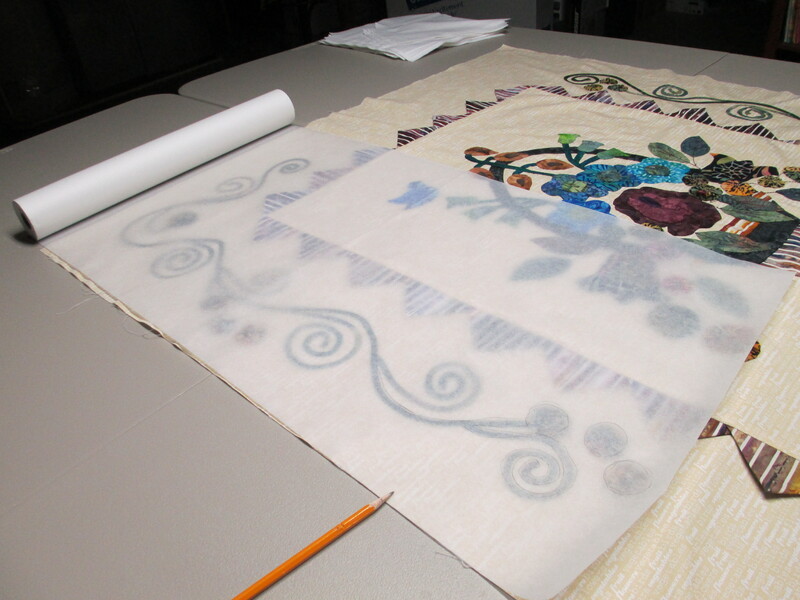 The artist for this quilt wanted her applique to shine. She had twisted vines along 2 corners, leaving the opposite 2 corners blank. I could have quilted anything in there. A lot of people would have put feathers in there. Personally, I think feathers are sometimes over done. I love them, but I also love to see variety in quilting. 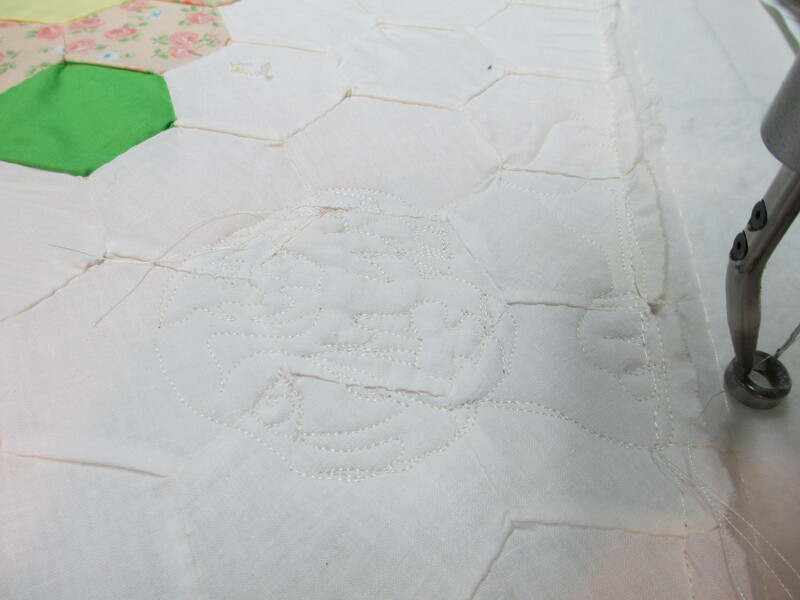 So, I decided to use this quilter’s applique as the basis for the quilting motif along the blank corners. I figured that would better show off her applique. 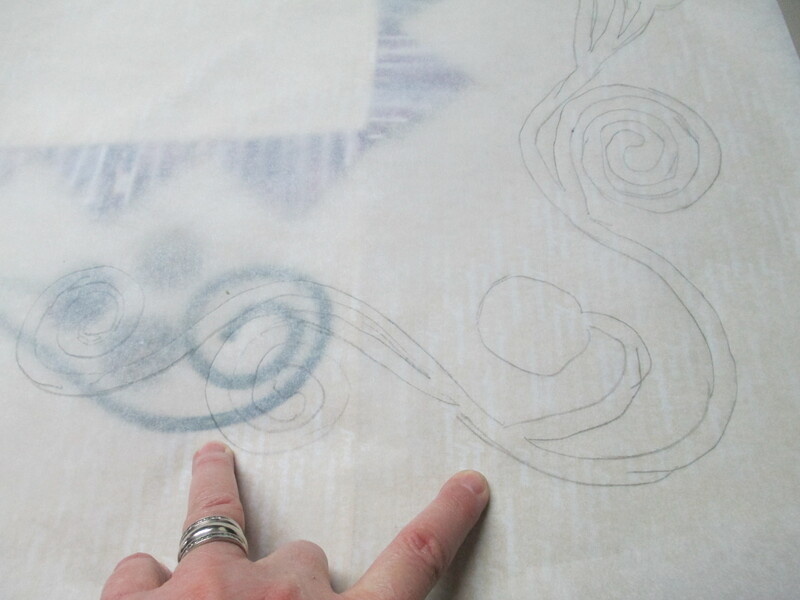 First I traced her design onto the onion skin paper. Then, I adapted her design to fit into the empty corners, by folding the paper and creating new curls in the vines. You can see here that the design is too long, so I will just take the vine from that curved corner and stretch it around to meet her appliqued vine (the area between my fingers). 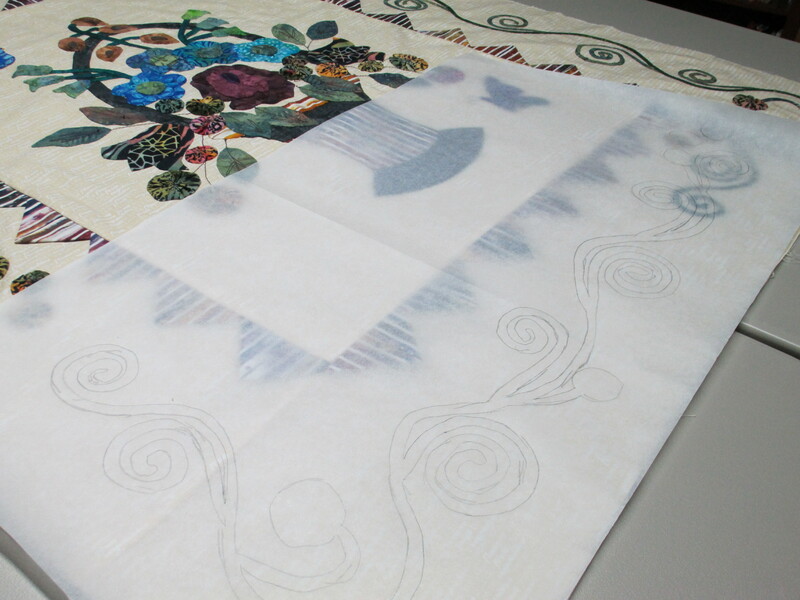 Now I have the 2 corner vines drawn onto new paper and ready for quilting. 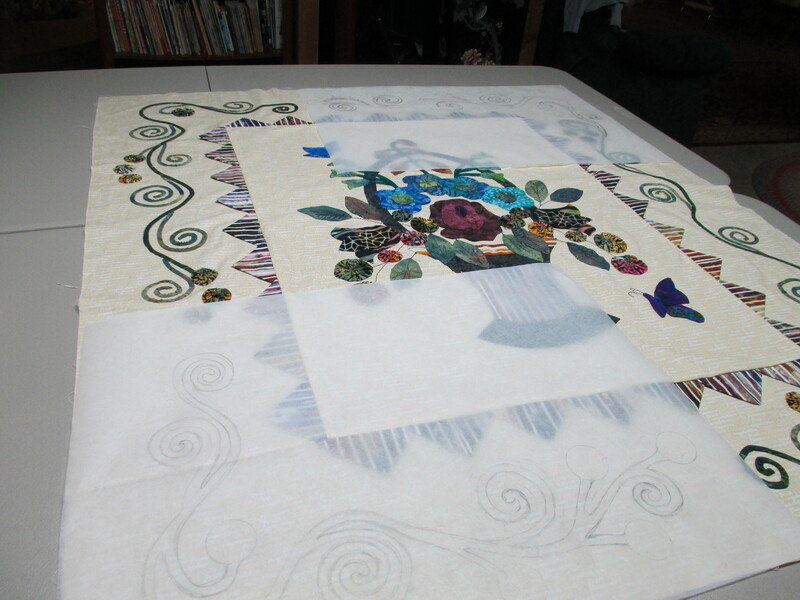 I’ve got it pinned onto the quilt and am ready to stitch-in-the-ditch (SID) around her appliqued vines and will stitch through the onion skin paper onto the quilt. After I quilted through the paper and quilt sandwich, I ripped the paper off. It snapped off cleaner than both tracing paper and vellum. I like it! So, I think my preference between tracing paper, vellum, and onion skin paper would have to be the onion skin paper. Good thing I’ve got a 50 yard roll, because I’m sure I’ll be using it for future projects. Stay tuned for pictures of the finished product in the near future! I’ll be filling in the area around the applique with stippling so it will pop! I like your photos of this project. I’ve used Golden Threads Paper in the past, but had to pick out the bits of paper. I’ll have to give the Onion Skin paper a try. I don’t use it often, but it’s handy. Thanks for sharing.